I know it’s LONG overdue but I’ve been excited to share our hard work on Kye’s party with everyone! I really, really loved everything and think it all turned out great. Last year when we did a monkey theme Zach wasn’t crazy about it (monkey theme = “gay” to him) so I promised him that this year we’d do something sports related. We picked GOLF! You can find a million football parties but golf stuff is tough to come by which made it more fun for me to plan. We didn’t do much decorating since the food was VERY themed but I did frame some pictures. These were from our first family golf outing. When ordering Kye’s invitations from Chickabug on Etsy she was SO helpful and sent me a link to a How Does She? golf themed party. I fell in LOVE with it and totally wished I could afford to copy every single thing she did! I took a TON of inspiration from that party but put my own twist on everything too. I’m now obsessed with her site and totally will be drawing ideas from it in the future (I almost hate to give away my new secret planning site to all of you!!!). I liked the idea of having a craft at the party and having something inside just in case it rained. It wasn’t an easy task to find this many green visor hats (had to special order from Hobby Lobby) but they turned out super cute. My mom has AMAZING handwriting so she made them even cuter by adding each child’s name in white paint marker. They were the kids “golf caps” and I got foam stickers and golf stickers for them to use to decorate. We used our dining room as the “food room” and used Zach’s golf balls for the centerpieces. I bought plain white cardstock and Mom used sharpies and golf stickers I bought (Hobby Lobby is the PLACE people!) and we came up with cute golf related sayings for most of the food items. On top of the “golfer food” we also had meatballs (thanks Mom! ), pigs in a blanket (thanks Mrs. Charlotte! ), and veges (we didn’t do a fruit – am I the only person that thinks fruit and veges are sooo lame at parties?!?! haha!). We had a TON of food! The party was from 4-6 so technically I guess we didn’t have to have so much but I love to have lots of food, I think it’s what people enjoy the most at a party. I knew a LOT of kids would be there and wanted to have something “kid friendly” so we put together a “Caddies Corner” with juice boxes (Kye’s first time ever having one…hopefully, but doubtfully, his last?!? ), animal crackers, and pretzels. I’m thankful that the punch from last’s years party was green because I could re-use it for this years (it’s seriously the MOST yummmy punch ever!!!). Brandon and Chrissy were a big help with these cute sandwiches and you can see how we did them HERE! Every party or shower that I throw I ALWAYS have to borrow Ashley’s adorable cake stand/cupcake stand. I swore I’d buy my own before Crissy and I throw her shower in a couple of weeks…but I don’t think that’s going to happen…isn’t it SO pretty though? I love how you can put the matching ribbon in it! Instead of having a cake I thought we’d just serve cupcakes and stick a candle in one when it came time to sing to Kye. I didn’t want everyone eating the cupcakes with the rest of the food so we put a tablecloth on the kitchen table and put the cupcakes in there. Didn’t they look cute? (You can see how I made them HERE). In the living room we had Kye’s Birthday Slideshow playing and it gave guests something to do while eating, during gift opening, and when their kids got worn out from the outside activities. We’ll probably do a video like this every year. I always love how they turn out! Last year I made my own banner, but this year I didn’t think it was worth the time and effort. Zach pretty much handled the outside stuff and we knew we wanted to do a driving range for the kids to hit golf balls. I bought green pails from Walmart and filled them with practice golf balls then Zach got indoor/outdoor carpet to use as the spot where they hit the balls (not sure what it’s called…haha). He also made the flags and put them in our yard for the kids to aim at! While the hats were inside and the driving range was out back – Mr. Rusty was nice enough to bring his golf cart over and at the front/side of the house the kids could go on golf cart rides! I like to try to have favors that adults and kids enjoy. Especially since at this age it’s still mostly adults that come to the party ya know? I made chocolate golf balls (you can see how I did them HERE) and had custom tees for each guest. Along with the invites and banner I also ordered stickers from Chickabug which she personalized to fit the party theme! They all turned out so cute and I loved the variety of the designs! I know most people thought we went overboard for a kids birthday party but I was SO proud at how it all turned out! I’m BEYOND thankful that I found the How Does She? site, that I had help from Chickabug in my planning, Country Kitchen for most of my food ordering, Hobby Lobby for most of the craft stuff and that so many friends and family helped make it all possible! 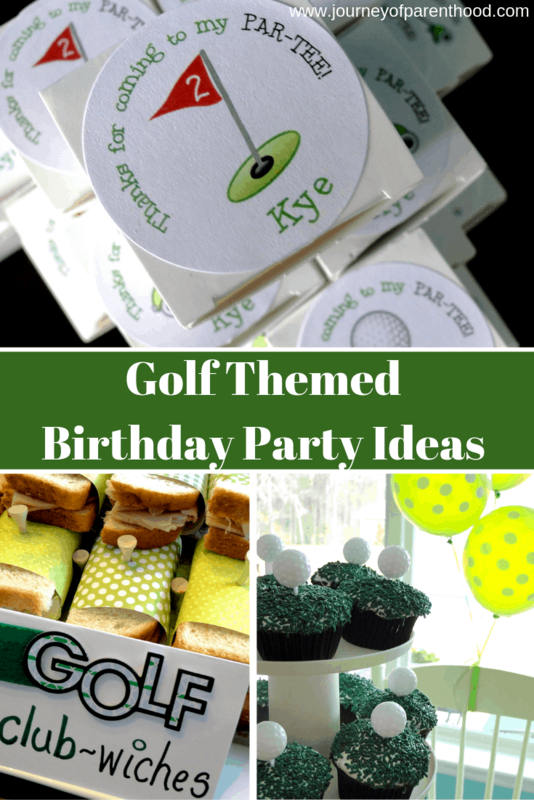 i googled kid's golf party and found your blog (and i'm so happy i did)! LOTS of great ideas here. i've already used and loved chicabug for some of the items for my son's first birthday. i was wondering, where is the cupcake stand from? i've been hunting for one that i like, but this one sticks in my head and i'm hoping i can find it! thanks!